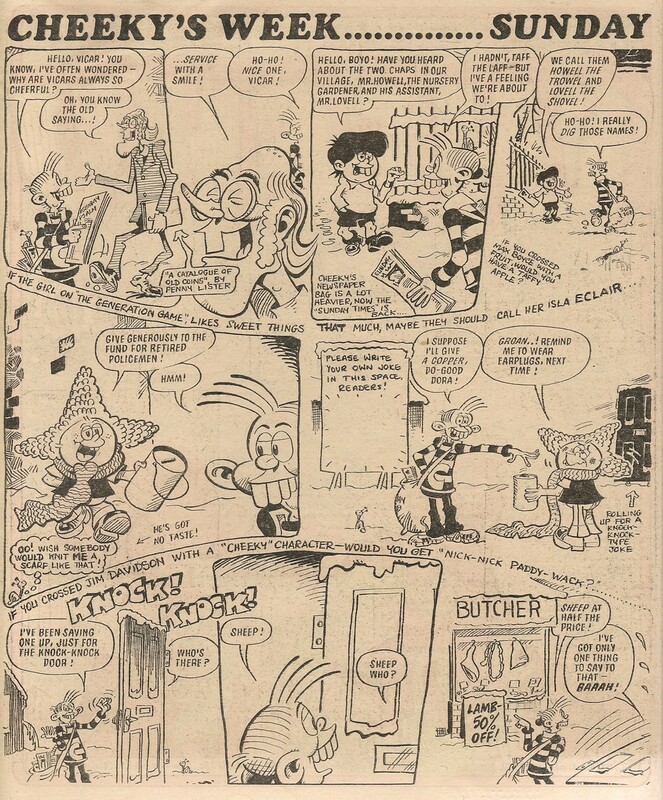 This concluding part of my short series examining Cheeky's festive doings in the Christmas 1976 edition of Krazy brings us to Cheeky's third strip appearance in that issue. 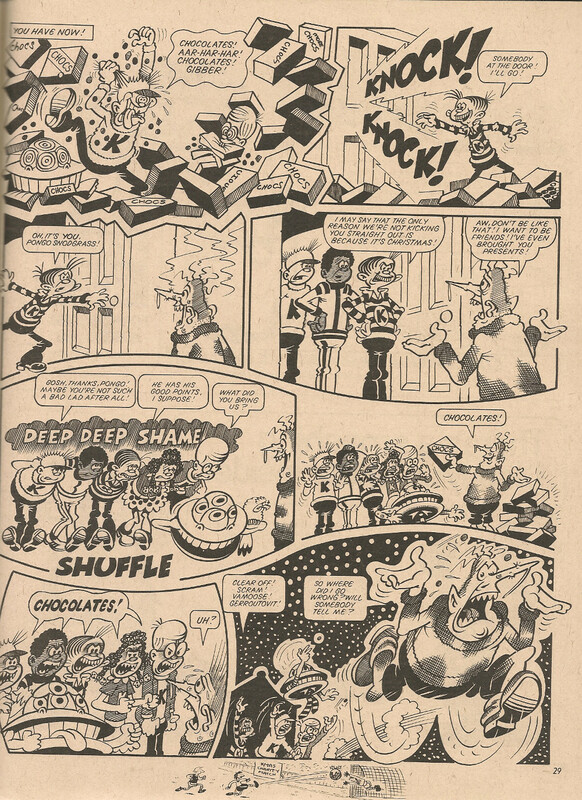 The Krazy Gang, who numbered Cheeky among their assorted human, avian and alien members, had appeared in Krazy from the first issue. 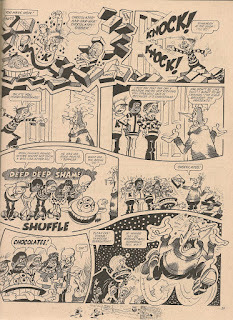 When Krazy folded in April 1978, the Gang were among the survivors to be absorbed into Whizzer and Chips, where their adventures (still including our toothy hero) continued until February 1986. It's always good to see Cheeky without his usual amused grin and I like the expressions of sheepishness on display in this strip. 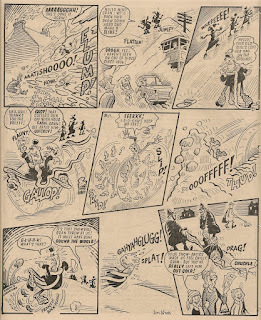 This is Pongo Snodgrass' second encounter with the Gang in this issue, and both feature similar final panels. Not quite the seasonal rapprochement one might have expected. Don't eat too many chocolates, and have a merry Christmas, Pals! Our toothy pal is certainly enjoying a high profile at the moment as, following cover appearances on recent issues of Comic Scene and Fanscene, next year he'll be gracing the cover of (and presumably be included among the reprints inside) a special Free Comic Book Day publication titled Funny Pages which you can read about on Lew Stringer's blog. Not long after appearing on the cover of Comic Scene issue 2, our toothy pal can be seen on the front page of another publication. 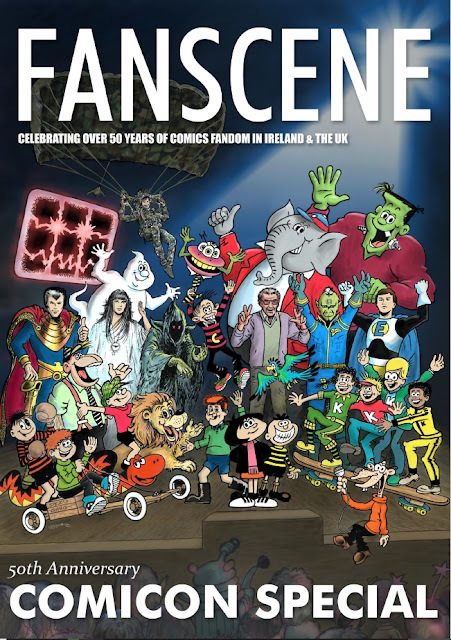 This time Cheeky is gracing FANSCENE’s '50th anniversary of UK Comic Cons' issue (free to download - although a donation to the charity of your choice is encouraged - here). 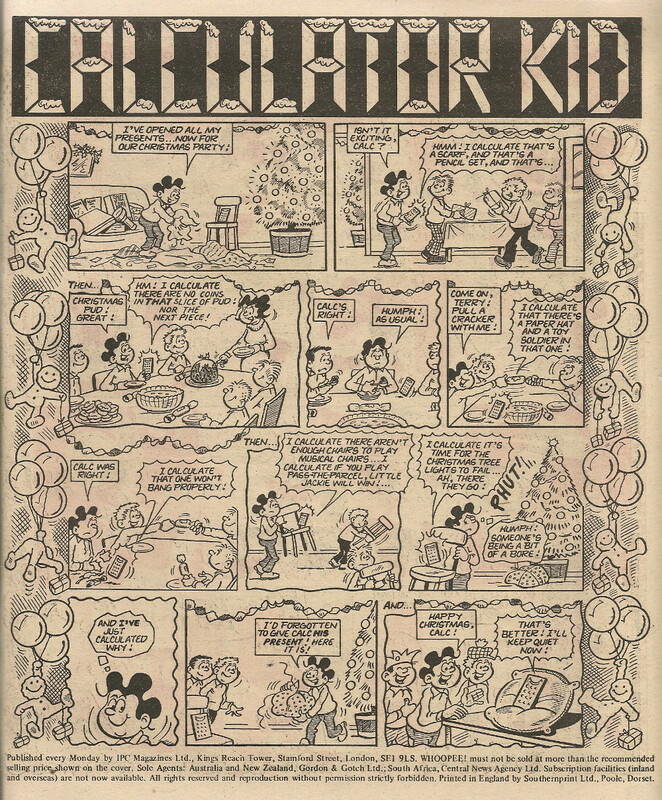 As is explained inside the ‘zine, the collection of characters depicted above have all performed the role of ‘editor’ of either a comic or letters page. 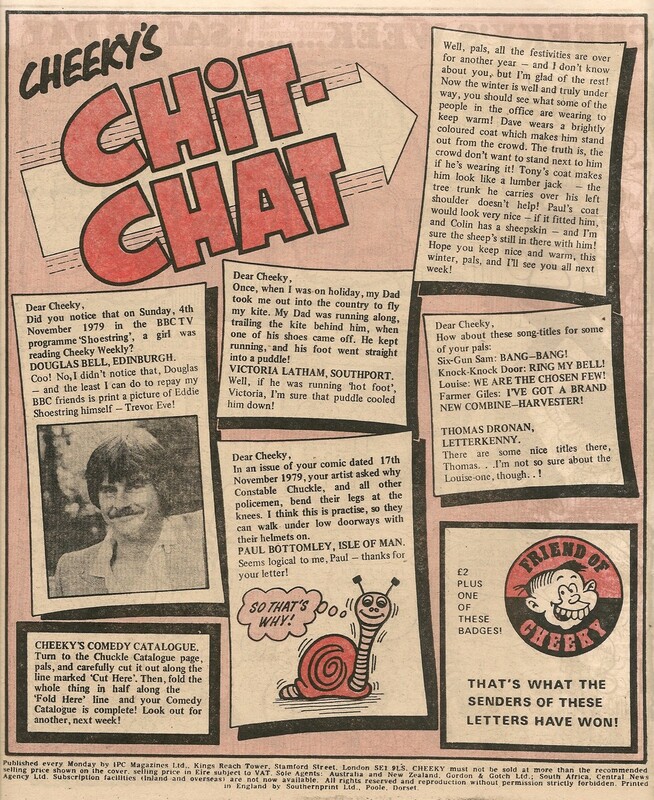 Cheeky was of course the editor of the Chit-Chat letters page. Unfortunately, other than a mention on the page that identifies all the comic greats gathered on the cover, Cheeky is not featured inside this issue – not really surprising as the focus is on recollections of various Comic Cons through the years. Sadly, CheekyCon has yet to be organised (although it can only be a matter of time - just think of the cosplay possibilities). 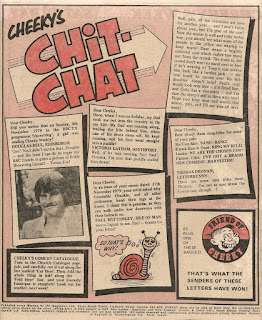 In the second part of this short series examining Cheeky's contributions to the Christmas 1976 edition of Krazy, we skip ahead to page 19, the site of 2 reader participation features. Our grinning pal joins his Krazy Gang chums to deliver a selection of readers' gags in the Krazy News-Pound. Over the page Cheeky is in the spotlight as his own 4-page 'Ello, It's Cheeky strip commences. 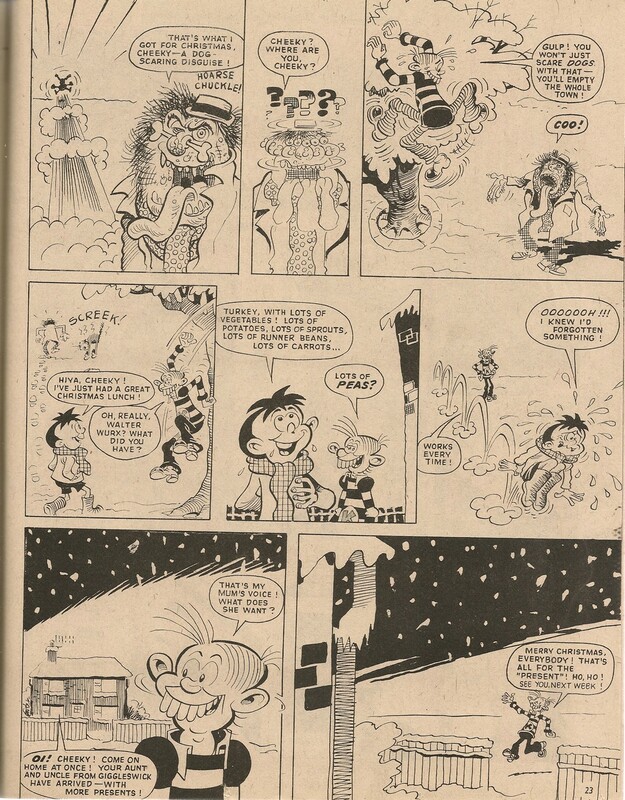 We know from Cheeky Weekly dated 19 January 1980 that Frank McDiarmid enjoys drawing snow, and the toothy funster's festive stroll around Krazy Town allows Frank to indulge himself in plenty of wintry scenes. right of the News-Pound page shown above. We'll leave Cheeky heading home to enjoy some more Christmas pressies, but join me again in a few days as I examine more Cheekiness from Christmas '76. I was so sorry to read on Lew Stringer's blog of the sad passing of the mighty Terry Bave. Terry of course drew Calculator Kid for Cheeky Weekly and the successful character continued in Whoopee! after Cheeky's comic came to an end. 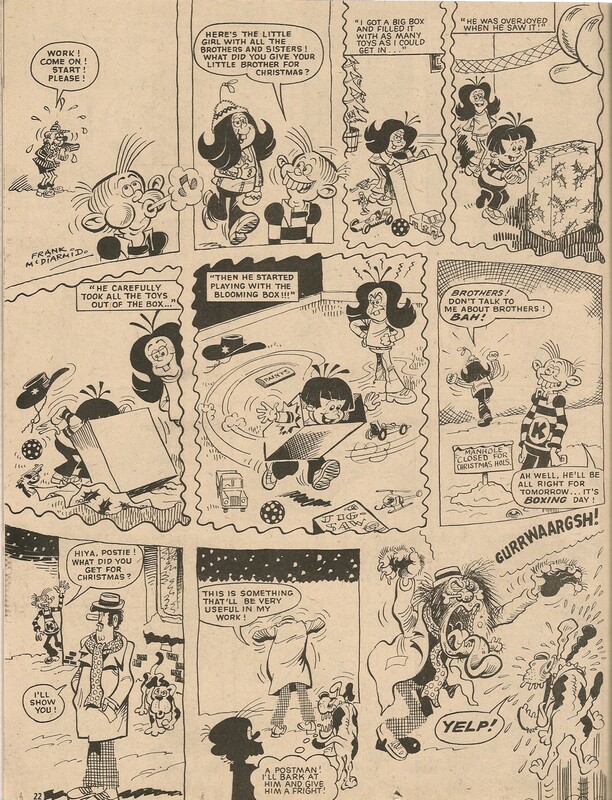 There was a time when it seemed Terry had artwork appearing in just about every comic in publication, with a never-ending roster of hugely popular characters created in collaboration with his wife Shiela. 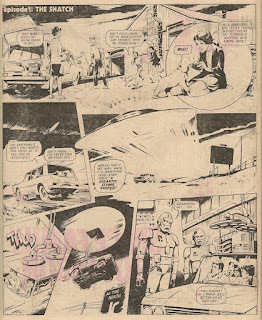 I always found Terry's artwork to be very appealing, and he depicted a world that was, despite the regular appearance of bullies who were a staple of comic scripts of the period, very cosy and reassuring as justice was always served by the end of the story. This time of year I particularly remember Terry's Christmas strips into which he put extra effort, enhancing the festive fun by drawing a border around them featuring clever seasonal designs. 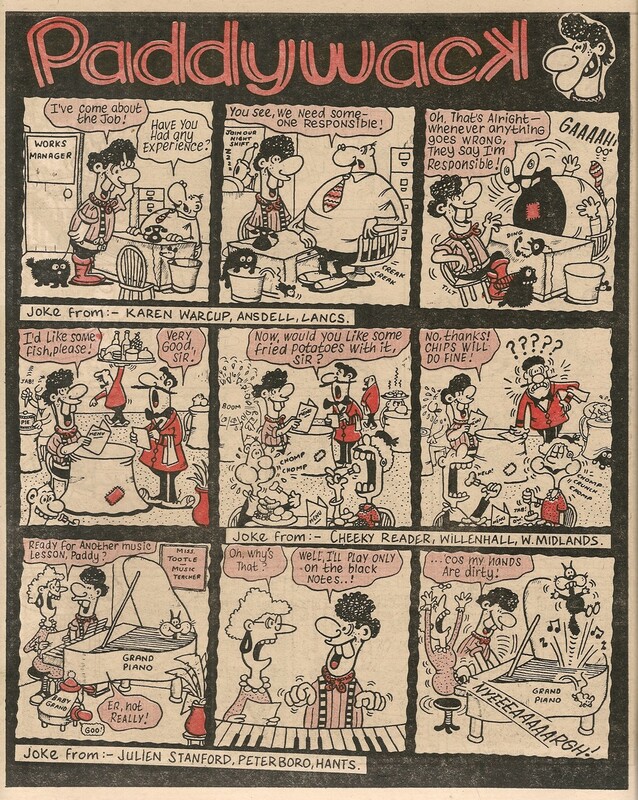 It's impossible to imagine the heyday of British comics without Terry's vibrant and always amusing strips. What a great legacy he leaves behind. My thoughts are with his family, friends and countless fans. 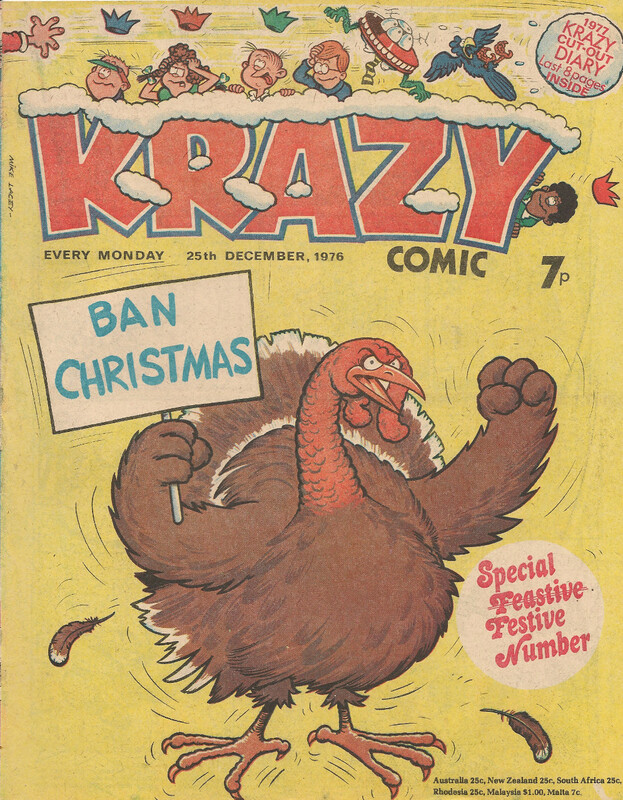 Cheeky made his debut in the first edition of Krazy dated 16 October 1976, and just a few weeks later the Christmas issue of that title saw our toothy pal participate in festive fun for the first time. 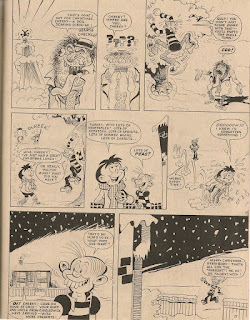 I've always assumed that Cheeky was supposed to be about 9 or 10 years old (and like most comic characters he remained the same age for the entirety of his nine and a half year comic career), so it wasn't strictly speaking our grinning pal's first Christmas, rather the first time that readers were able to observe his seasonal escapades. 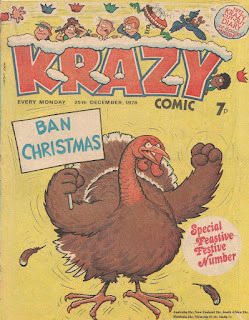 Cheeky appeared on the cover of Krazy's Christmas '76 edition, in his role as a member of the Krazy Gang, all of whom were depicted cowering behind the snow-bedecked comic title and narrowly avoiding being hit by a ginormous snowball. 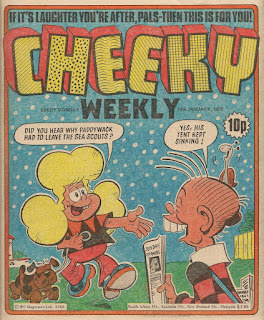 Cover artist Mike Lacey would later draw the toothy funster in Cheeky Weekly. 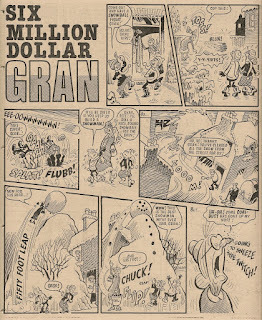 On page 2 the Gang were involved in a story featuring their niffy nemesis Pongo Snodgrass (who I suspect launched the icy projectile at them on the front cover), drawn by Ian Knox who would go on to depict the adventures of Cheeky Weekly's second-longest surviving character, 6 Million Dollar Gran, who, in her post-Cheeky Weekly career, evolved into $6,000,000 Gran then later Robot Granny and finally Gran (leader of Gran's Gang). 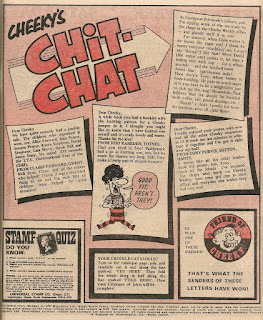 As of Krazy's Christmas 1976 issue, Cheeky's jumper still showed his Gang (and therefore comic) affiliation - his more familar 'C'-bearing top would appear in August of the following year in preparation for the October launch of his own title. 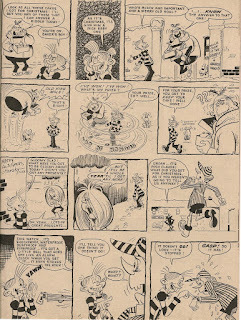 Join me again in a few days for the second part of this examination of Cheeky's 1976 Christmas capers. A week after being raided by Toy Boy, Mustapha embarked on a revenge mission into Whizz Town (Whizzerton? Whizzville-on-Sea?). Can you spot our prosperous pal in this Memory Banks page? Maybe our middle-eastern mate (who was always concerned about his pals' welfare) had recently bought the health food shop and that was why he was inside. This is the first Cheeky-related raid of the era covered by this series of posts to involve the recollection-deficient Master Banks. As Mustapha is the raider rather than the victim, at least we're spared the hackneyed 'I made a mug of Mustapha Million' boast this time. 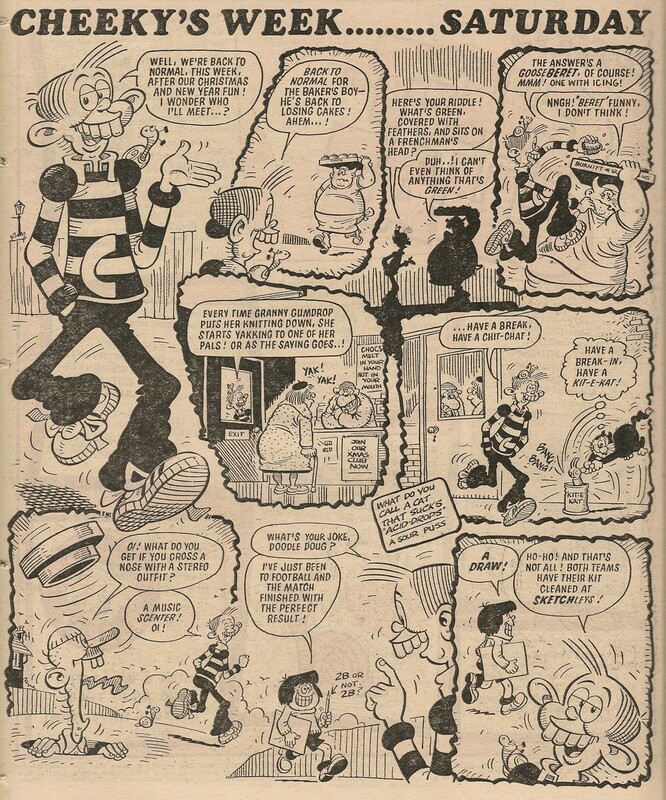 Following Lew Stringer's recent post concerning Cheeky Weekly, from which I discovered that the Mystery Boy artist is John Richardson, I have now assigned John as the artist on all 52 episodes of the feature and also the 2 Mystery Boy covers. As a result I have regenerated the contents tables of the issue summaries relating to the 52 affected issues, plus the Cheeky Weekly Index and the Cheeky Weekly Artist Index, and also the Mystery Boy post in the above link. Back in 2013 Russ Juckes responded to my Space Family Robinson post, informing me that John Richardson was the artist on the first 23 episodes of the sci-fi thriller. Until reading Lew's post above I'd never realised that the original Robinson artist was the same person who illustrated Mystery Boy (although, assuming it wasn't a reprint like Mystery Boy, the Robinson artwork was completed some years later than the World War II adventure). 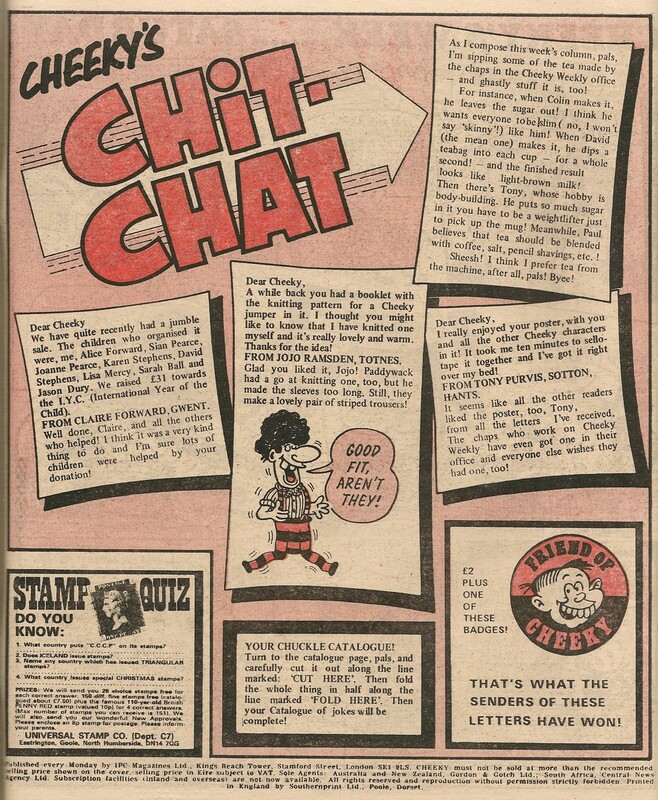 Lew Stringer is looking back at Cheeky Weekly from forty years ago this week. 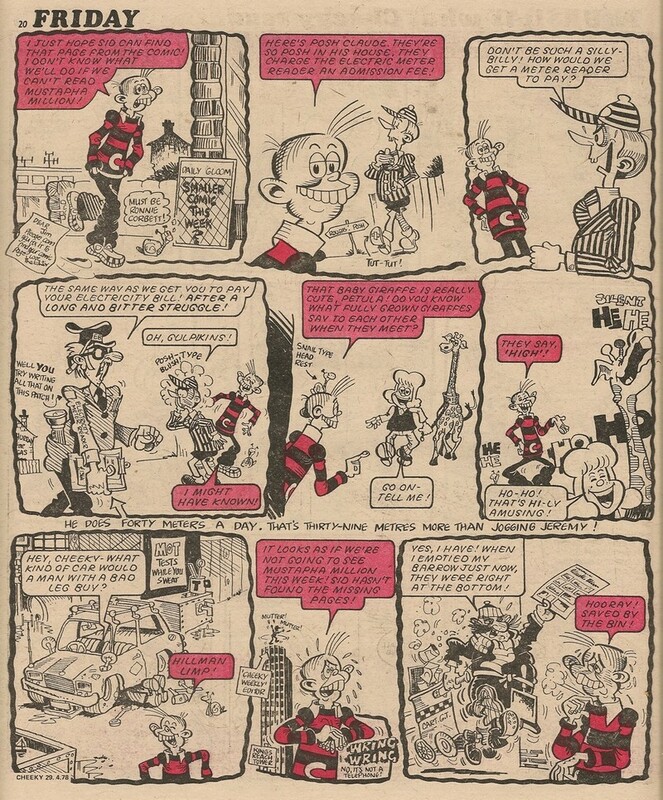 Thanks to Lew's post I now know that Mystery Boy was drawn by John Richardson. Last month I finally got round to assigning the relevant Creepy Sleepy Tale episodes to Keith Reynolds, and following on from that I have now updated all the 'contents' tables in the issue summary posts covering Cheeky Weekly issues 1 to 96. This means that the contents now show Keith as the artist on the CST elements that he drew, and also Jimmy Hansen as the Skateboard Squad and Speed Squad artist for this run of comics (longtime followers of this blog may recall my Mike Lacey and Jimmy Hansen crisis of a couple of years ago when I realised that I had wrongly assigned the two strips as being drawn by Mike). The summaries for issue 97 onward have shown the correct artist details for Speed Squad so they don't need amending. 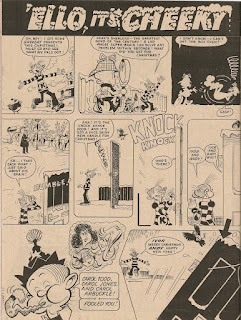 The artist credit for the Disaster Des strip in Cheeky Weekly dated 13 October 1979, the only time that Des was illustrated by Jimmy, was updated in the aftermath of the 'crisis', some months before I originally posted that particular issue summary, so does not require amendment. The microchip machinations of Calculator Kid’s electronic advisor deny Charlie a breakfast. The local bird population benefits, and a peckish Charlie sets out into the streets. It would seem that this story occurs early on Sunday, before the residents of Krazy Town were troubled by snow. The tale ends at a porridge-eating contest (referencing the huge popularity of porridge-eating contests in the late 1970s), and you can guess who takes the prize. 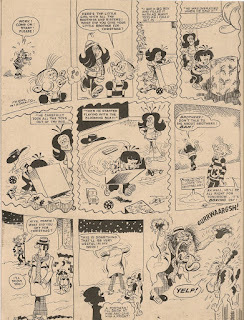 Cheeky's Monday follows a page of Paddywack gags, and Krazy Town still has a covering of snow as the toothy funster enjoys the usual banter with his pals. Rain, not snow, is the problem for Mustapha Million and his chums as they try to enjoy a footie game. However, Mustapha was never shown to be resident in Krazy Town (initially he was presented as a fictional character as far as Cheeky was concerned) so the variance in weather conditions need not trouble us. Following directly from our middle-eastern mate are the junior troupe of aspiring performers and their showbiz-hating tutor who make up the main cast of Stage School. Contrary to the climatic conditions apparent in Cheeky’s world this week, the weather seems fine as Sir sets the kids an initiative test by driving them out of town then abandoning them to find their own way back to school. 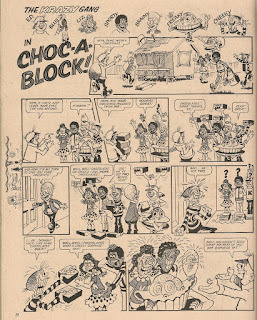 Of course this particular strip’s relationship to Cheeky’s universe was never specified, as the feature commenced in the 07 July 1979 'new look' issue, a week after the Mystery Comic concept was dropped, and at a point in Cheeky Weekly’s evolution when the framing sequences which for a time explicitly established a relationship between each of the non-Cheeky’s-Week contents of the comic and the toothy funster’s pages had, with one exception, been abandoned*. 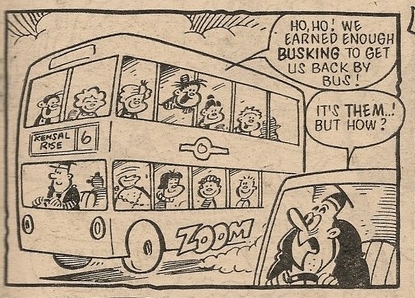 The resourceful kids raise some cash and catch a number 6 bus going to Kensal Rise, an area of north London. Unless the bus route has changed in the intervening years, a number 6 does not usually terminate at Kensal Rise – the full southbound route runs from the delightfully-named Bertie Road, Willesden, to a stop designated Aldwych/Drury Lane in central London. I would have expected the Stage School kids to have waited for a bus that would take them to Drury Lane, often described as 'the heart of London’s theatreland'. 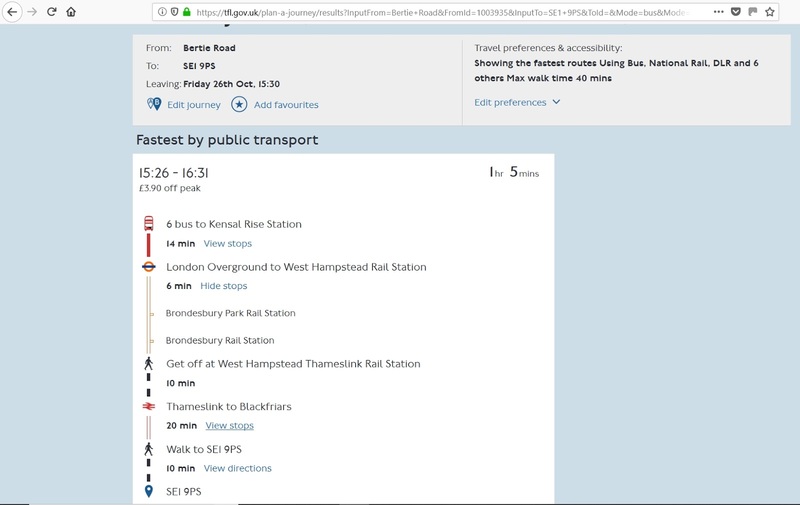 However, I suspect that the bus route reference is a private joke – possibly one of the staff in the Cheeky Weekly office lived in or around Kensal Rise. In 1980, Cheeky Weekly publisher IPC was based at King’s Reach Tower, so I used Transport for London’s Journey Planner to devise a route from Bertie Road to Stamford Street, the location of that famous edifice, to see what route a Willesden-based IPC employee might take to get to work. 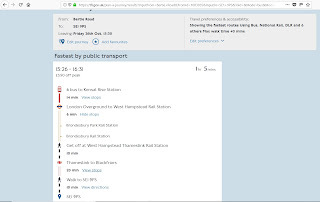 The first route suggested by TfL didn’t involve travelling on the number 6, but it did use the Jubilee underground line, which began operating in May 1979, and I wondered what would be the effect of excluding tube travel from the journey. Having removed subterranean commuting from my request, I updated the page and found that the suggested route takes our putative north-London-dwelling Cheeky chappie or chappess on the number 6 from Bertie Road to Kensal Rise rail station, and thence by a combination of train and foot, to postcode SE1 9PS, the location of South Bank Tower, formerly King’s Reach (not only has the name of the building changed since the time of Cheeky Weekly - the postcode in those days was SE1 9LS). 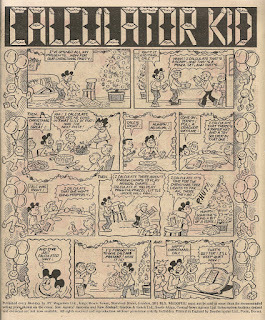 * The 6 Million Dollar Gran story in the 14 July 1979 issue was the final strip to feature a framing element. For more info see here. On Tuesday we see that someone (possibly Sid the Street-Sweeper?) has kindly cleared the snow off Lily Pop’s zebra crossing. There are cold conditions for Soggy the Sea Monster's reprinted escapade, but not due to the chill affecting Cheeky's home town. The silly sea serpent ventures up to the frozen north and gets hooked by a local fishing through a hole in the ice. Needless to say he doesn’t end up in somebody’s frying pan alongside some chips. This week’s Why, Dad, Why? 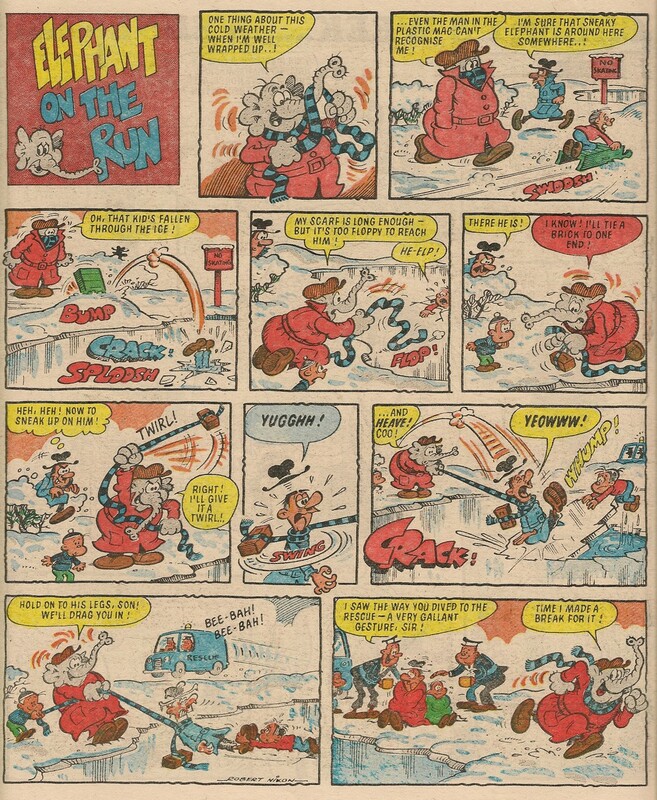 Shows Dad and Son heading for the pictures via streets clear of snow, but the strip was originally included in the Mystery Comic so was a work of fiction set in an unspecified location as far as Cheeky was concerned. It’s cover co-star Petula’s turn to feature in the Cut – Out Comedy Catalogue which, as one might expect, is full of animal jokes. Frank McDiarmid’s note on the Wednesday page explains this week's weather in Krazy Town. 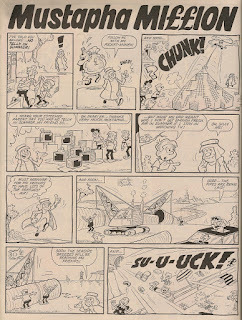 The link between Cheeky’s world and that of Elephant on the Run (initially a strip in The Mystery Comic as was the above-mentioned Mustapha Million) became an ambiguous one when Elephant and The Man in the Plastic Mac appeared on the Wednesday page in the 12 May 1979 issue. Their adventure this week is a snowy one, suggesting that they may indeed share Cheeky’s universe. The next strip, Disaster Des, also originated in the Mystery Comic and was firmly set in Des' home town of Doomsville, so it's no surprise to see the streets clear of snow as Des mooches along, unconcerned by the mayhem he's unwittingly unleashing as he goes. However, the majority of the story focuses on Doomsville's long-suffering Mayor, who finds that he can't escape the negative influence of the junior jinx even while on a well-deserved cruise (although choosing the Bermuda Triangle was pushing his luck somewhat). 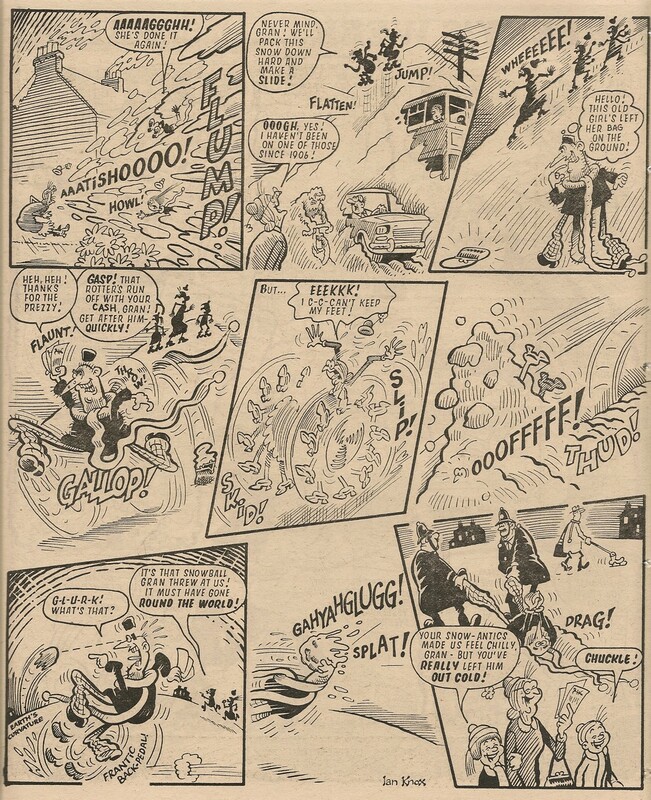 The Gang's reprinted adventure from Whizzer and Chips is also untroubled by snow as the youngsters prepare to enter a vintage car in an 'old crock's race', which was one of those terms that was, as far as I'm aware, only ever used in comics, never in real life. See also 'spifflication' and 'slap up feed'. 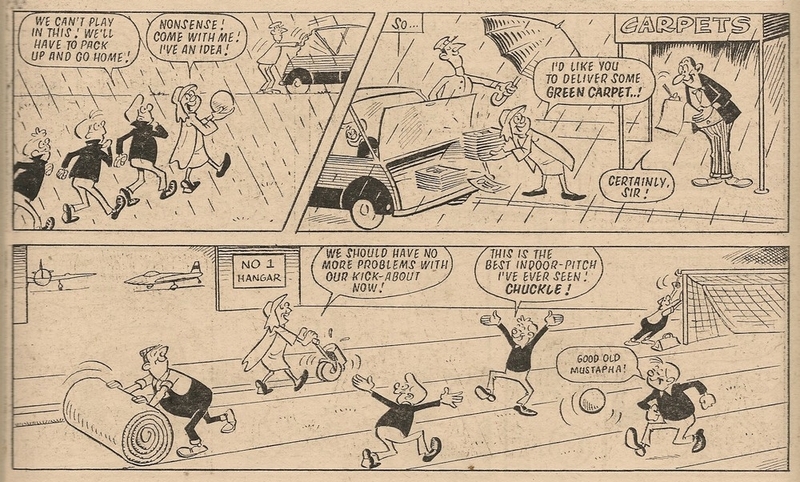 There's no sign of a thaw as Cheeky does his Thursday round of jokes and japes, after which Tub, who is the last of the former Mystery Comic inhabitants to appear this week, gets stuck in the turnstile at a football match, with no snow to be seen. 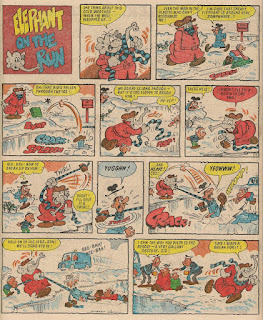 Speed Squad, who were shown to occupy Cheeky's Krazy Town setting while appearing under their former title of Skateboard Squad as well as in their current guise, are pleasingly enjoying a tobogganing session as their story commences, the snow depicted as they race downhill matching the icy conditions evident in this issue's Cheeky's Week strips. 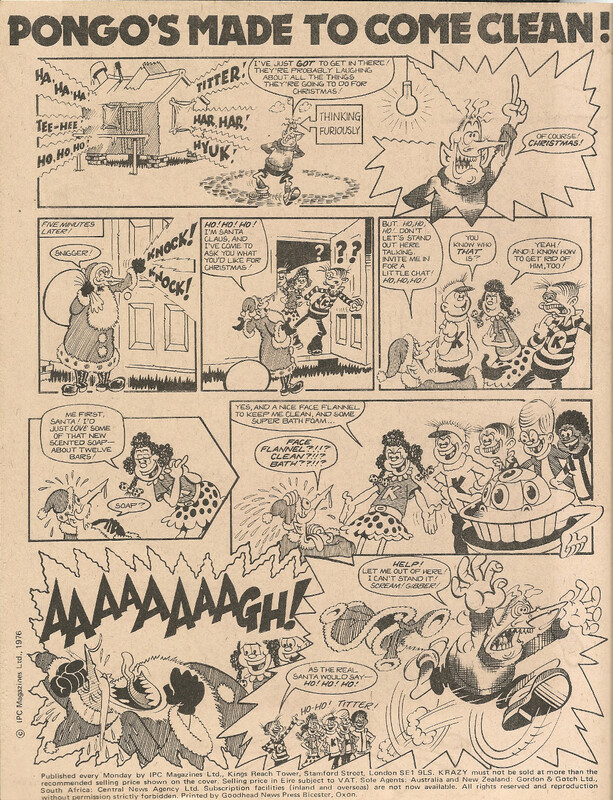 Cheeky then enjoys a frosty Friday, following which there's a 6 Million Dollar Gran spot-the-difference puzzle, the artwork for this filler having been lifted from her adventure in the 17 March 1979 edition. This is Gran's only appearance this week, her usual strip is absent. Following 2 pages of readers' rib-ticklers in Joke-Box Jury, is another filler (although just half a page this time, sharing its location with an ad for IPC's sports-inclined title Tiger which next week, as part of the publisher's unwavering campaign to encourage readers to dismantle their comics, will be commencing a 1980 Winter Olympics booklet pullout) in the form of Jogging Jeremy's 'weak'ly exercise routine. There are some more insights into life in the Cheeky Weekly office on the Chit-Chat page. Which of the chuckle crew live in Kensal Rise? 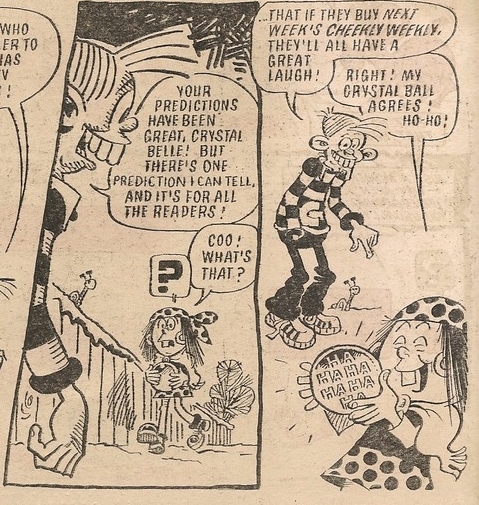 It's still snowy underfoot on Saturday, as the toothy funster learns of Crystal Belle's 1980 predictions for some of his pals (the impending move into the pages of Whoopee! not being among her prognostications). Our grinning pal then signs off, although he's featured on the back page in Snail of the Century, in which we see that the chilly conditions are also affecting Snail's back-yard buddies. 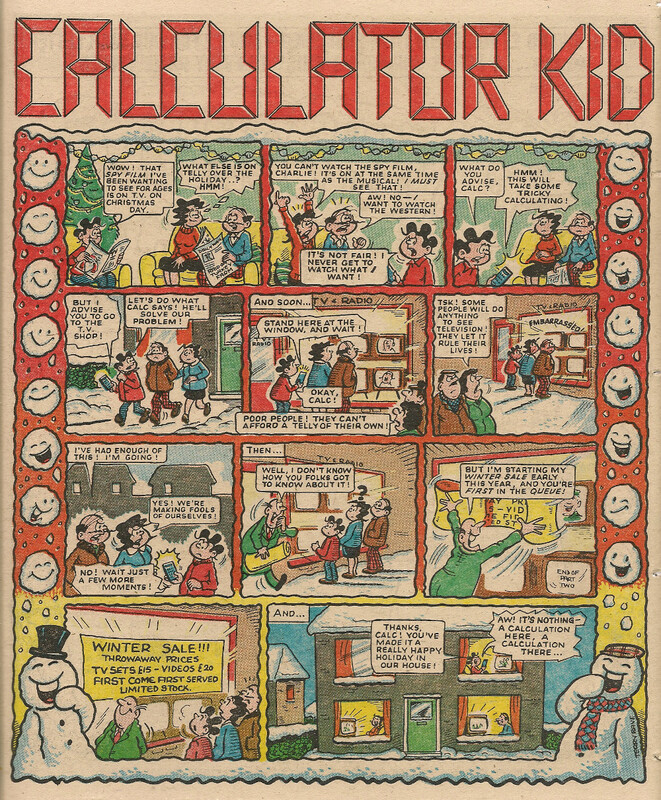 I think all readers will have enjoyed this issue at least as much as Frank McDiarmid enjoyed drawing the snowy Cheeky's Week. This is something I have been vacillating over since at least 2011, but as the Cheeky Weekly phase of this blog nears its conclusion I felt I must now grasp the metaphorical nettle and have finally got round to assigning to Keith Reynolds the Creepy Sleepy Tale artwork that was not by Mike Brown, Mike Lacey or Tom Paterson. 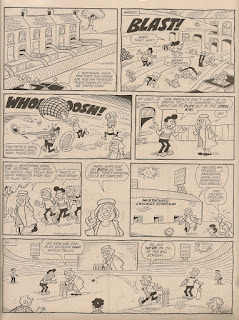 It therefore emerges that Keith was the most regular artist to draw the feature, with 34 episodes to his name. 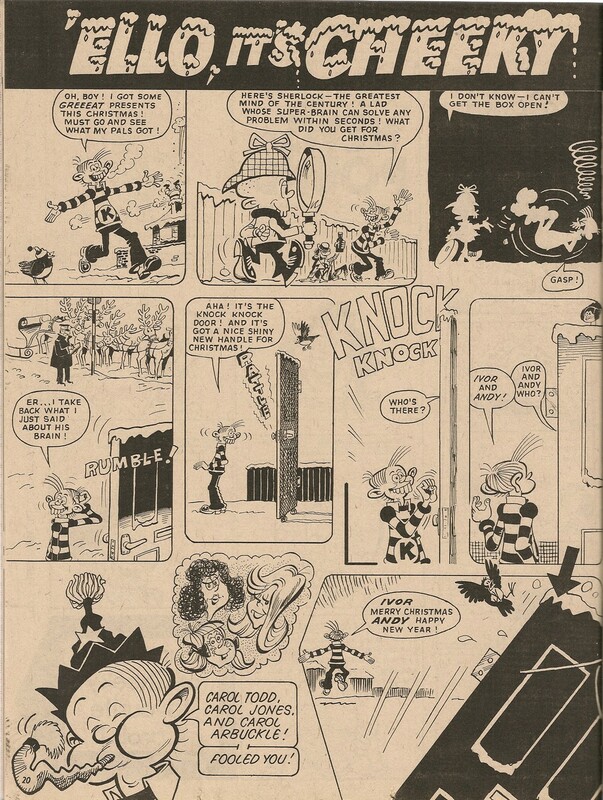 Although on the blog I had assigned Christmas 1977's Creepy Pantomime variant to Keith way back in 2010, I hadn't actually updated my comic database to reflect this, so the necessary change has also been made in that respect. I haven't totally got my mitts around the irritating vegetation yet, as I now need to go back and update all the contents tables included in the issue summary posts relating to the affected editions but I hope to do that in stages when time allows. 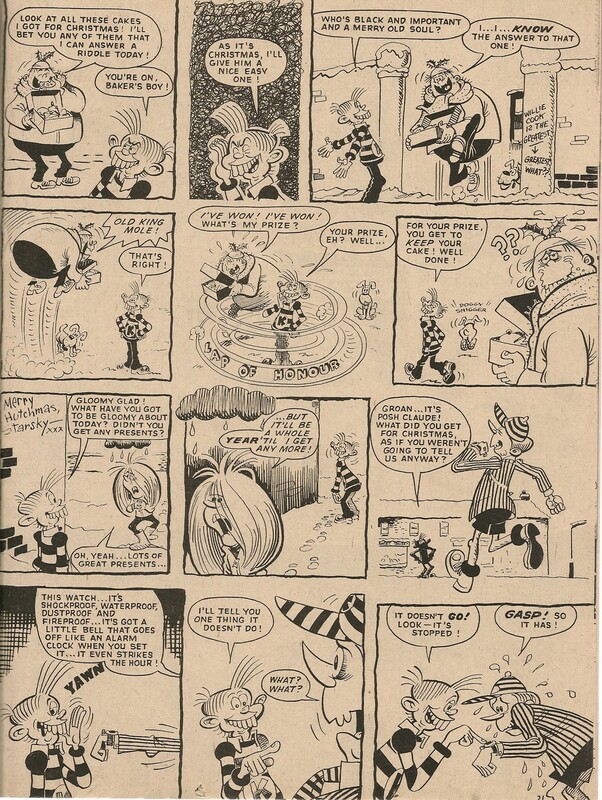 Readers who have been following this blog for some time will be aware that this series of Profile posts examines the named characters who appeared alongside the toothy funster in his daily ‘Cheeky’s Week’ pages. 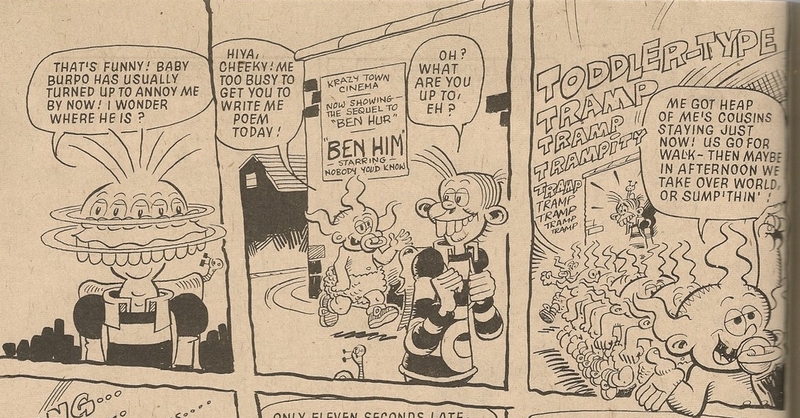 Cheeky Weekly’s USP (at least in its early days) was that the Cheeky elements acted as framing devices for all the other features in the comic. A number of the characters from the non-Cheeky features were shown to share the same universe as our grinning pal. 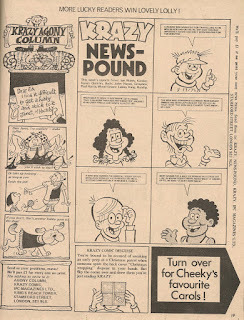 For example, Skateboard Squad and Calculator Kid were seen on the Cheeky pages a number of times. 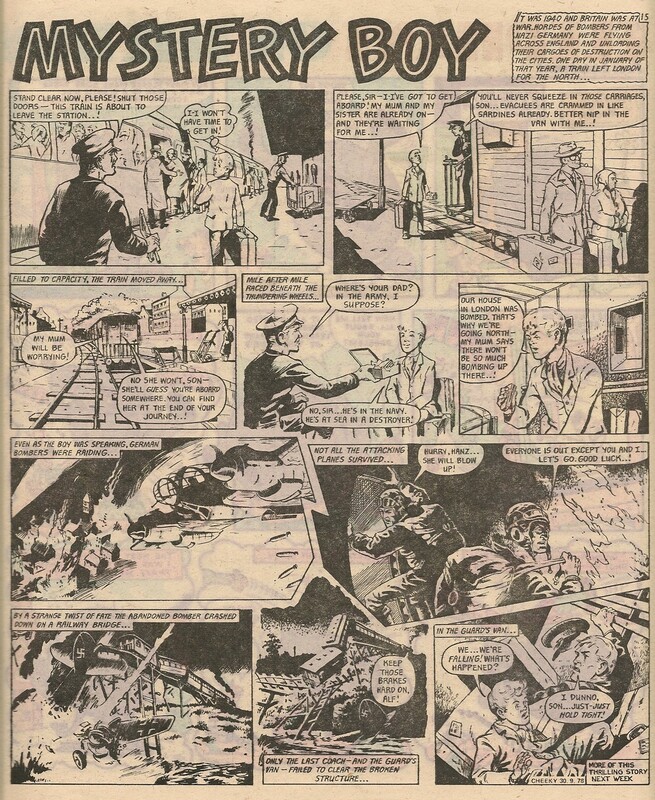 Other features had a metafictional relationship to Cheeky’s world; James Bold was the hero of a series of novels (and later a film) which Cheeky enjoyed, and Elephant on the Run was a strip in our grinning pal’s favourite funny paper, the Mystery Comic. 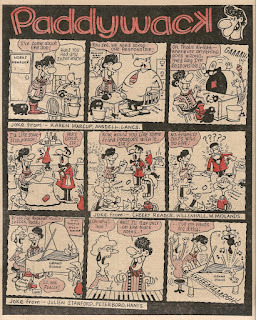 In some cases Cheeky Weekly blurred the reality boundary by incorporating fictional-from-Cheeky’s-perspective characters into the Cheeky pages; Paddywack was initially presented as the subject of a cartoon strip drawn by Doodle Doug, but was later seen at the cinema during a Saturday morning pictures sequence, and on one occasion the titular pachyderm from Elephant on the Run, plus his plastic-clad pursuer, turned up in Cheeky’s Week. 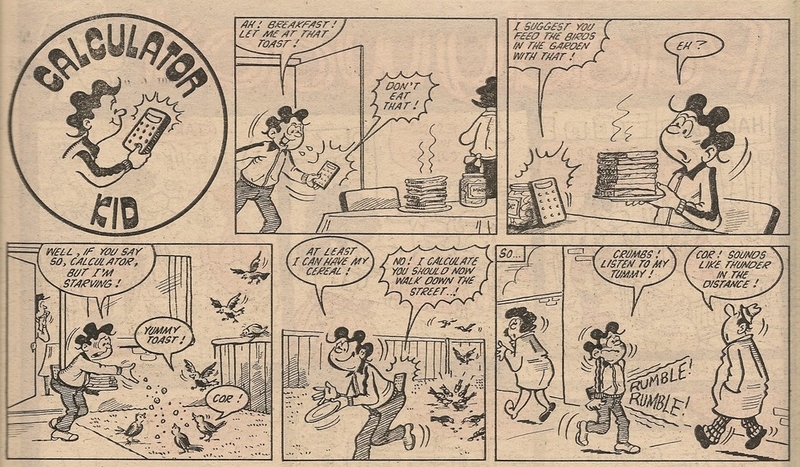 Were these examples of the scriptwriter deliberately being playful with the whole concept of the ‘reality’ depicted in comics, or rather the result of lapses in concentration? You decide. 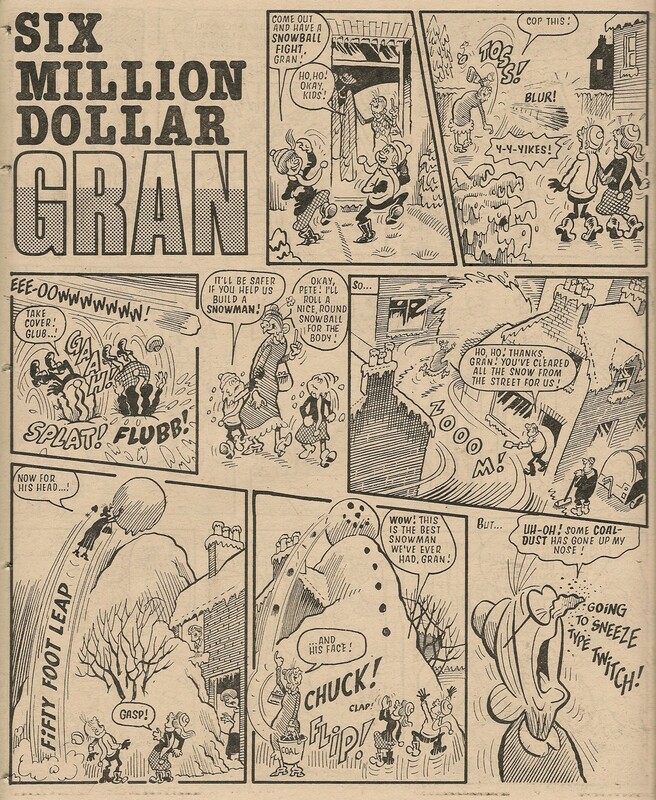 6 Million Dollar Gran, initially presented as the robotic star character in Cheeky’s favourite humorous sci-fi/fantasy TV show, made one transition across the fictionality interface into Cheeky’s world. 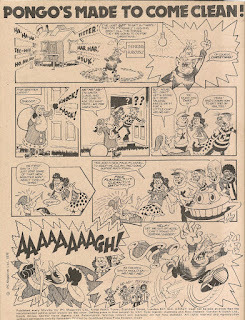 In that particular case, I think we can excuse the comic’s creators for what some may consider to be a gaffe, since Gran’s sole Cheeky’s Week appearance occurred in the final issue of the toothy funster’s comic, during a sequence in which all those funny folk who would be transferring into Whoopee! the following week were shown meeting their new comic colleagues, and therefore the scriptwriter had no option other than to include the synthetic senior citizen. Additionally, the depiction of Gran as a TV character ceased following the 14 July 1979 edition of Cheeky Weekly (Gran’s being the final framing device to be dropped from the comic), and her former TV star status was never mentioned in Whoopee! so it was simpler to assign her to the same level of reality as her Cheeky chums in the final issue of Cheeky's mighty, if short-lived, title. 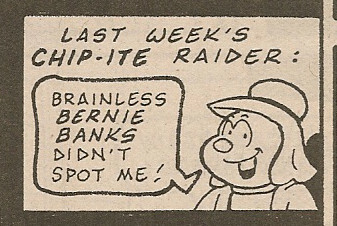 Any blog readers cross-referencing to the list of Cheeky's Week Characters will be understandably puzzled by the discrepancy between this post's mention of Gran's single appearance and that list's total of 5 appearances by the robotic senior citizen. The difference exists because the Cheeky's Week Characters list includes in the total Cover Features containing the relevant character, whereas the figures shown in these Profile posts excludes Cover Features. 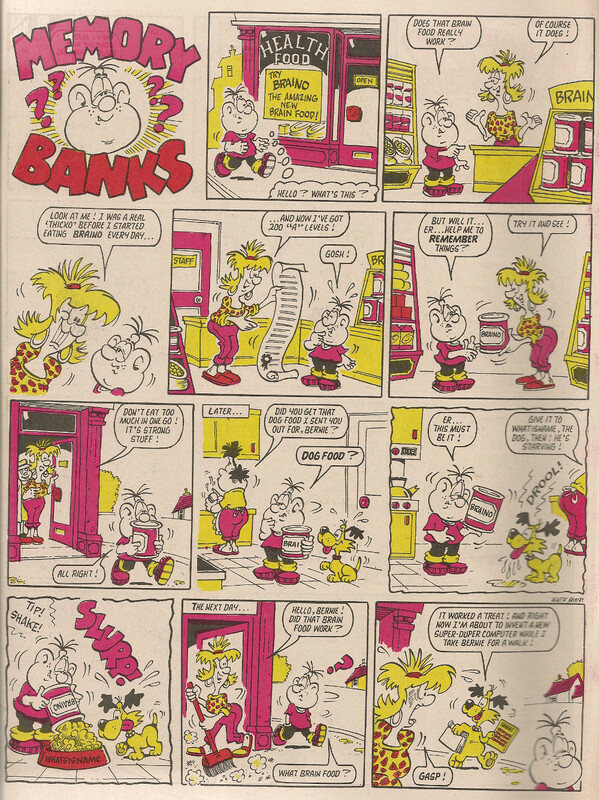 The description Cover Feature is one I use for elements that appear on page 1 but which are not comic strips (What a Cheek and its replacement Cheeky's Week were the main cover strips). Gran's front page appearances that I have classified as Cover Features are on the 12 November 1977, 29 July 1978, 02 September 1978 and 21 July 1979 issues. It's now apparent that my assignment of Cover Feature is not really adequate - I should have created an additional category called something like Cover Feature - Cheeky-Related, which would have meant that the single-panel Cheeky gag covers would have been identified separately from the cover features such as those listed above. Maybe I'll get round to reclassifying those elements one day. As if one terrifying toddler wasn’t enough for the toothy funster to contend with, the introduction to 26 November 1977’s Creepy Sleepy Tale revealed that there were in fact a further 5 (possibly more) belligerent babies in the same mould. Despite the presence of the cousins, only Burpo was seen in the post-creepy-sleepy-tale scene as Cheeky left for home, and this was the case on all the subsequent occasions on which the myriad of mini marauders appeared prior to the Wednesday bedtime story. 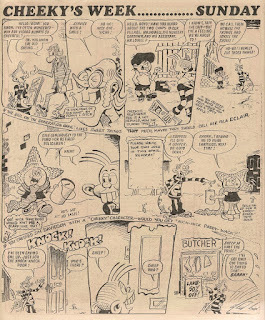 The kiddie cousins’ next appearance was in the 'Ello It's Cheeky strip in Krazy dated 14 January 1978, the only time they featured in that title, in which we saw there were at least 6 mini mischief makers in addition to Burpo, although the line of Burpo-alikes was emerging from around a corner so there could have been many more. 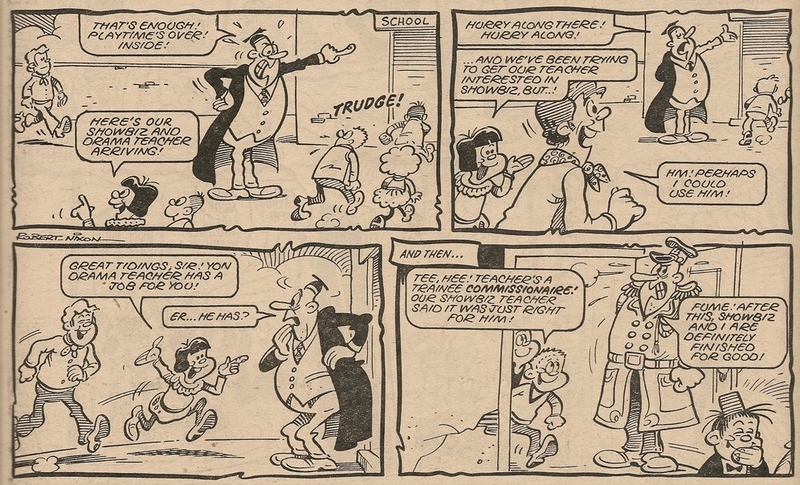 The toddler troupe’s next Cheeky Weekly appearance was in the 11 February 1978 edition, in which on Monday Cheeky hid himself among the nappy-wearing throng in order to enter the newsagent’s unseen for a free read of James Bold novel The Ghost Highwayman. The toothy funster’s usual perusal of 2-comic-pages-worth of the supernatural thriller was interrupted on the Suddenly page when the cousins gave him away, and he was propelled from the shop by the proprietor’s boot. The cousins were back on Wednesday in the same issue when, in the pre-Creepy Sleepy Tale sequence we witnessed 12 cousins in addition to the ‘orrible original, although once again only Burpo was in evidence in the post-Tale conclusion. 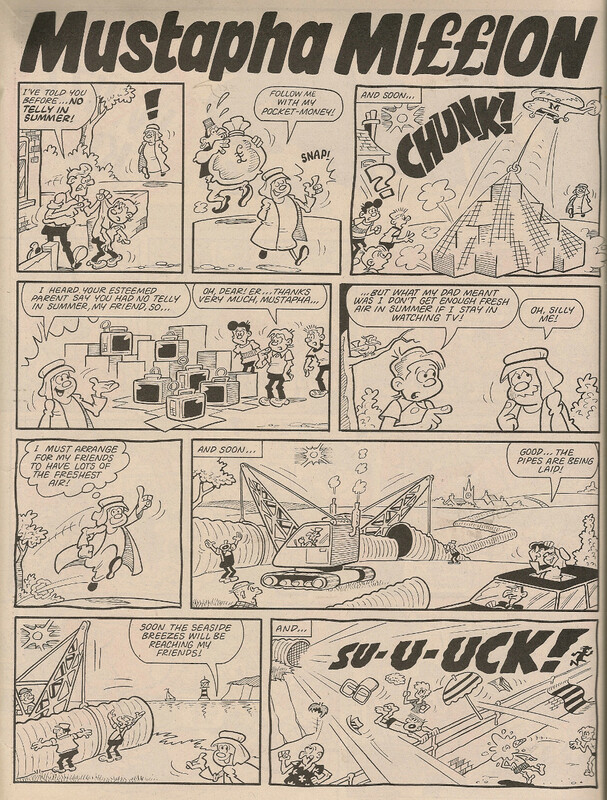 This three-pages-of-cousins issue was the only one in which the toddling terrors appeared on more than one page, and also the only time they featured on any day other than Wednesday. 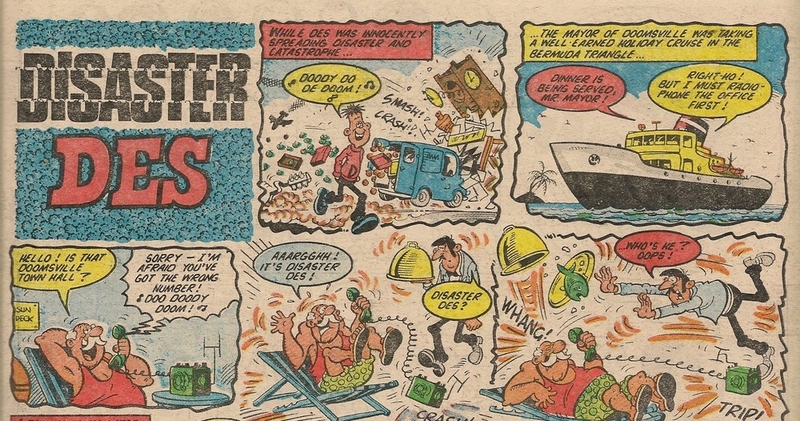 Cheeky was again waylaid by Burpo and rowdy relatives as he arrived for his Wednesday babysitting ordeal in the 06 May and 29 July 1978 issues. 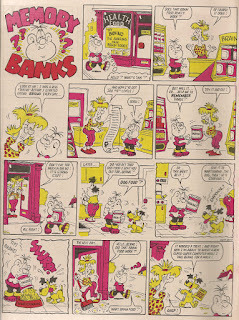 Our toothy pal expected to be free of Burpo, let alone the attendant horde of diabolical dummy-suckers, when he embarked on a canal barge holiday in the comic dated 12 August 1978, but found himself being forced to walk the plank by a plethora of piratical potty-perchers. 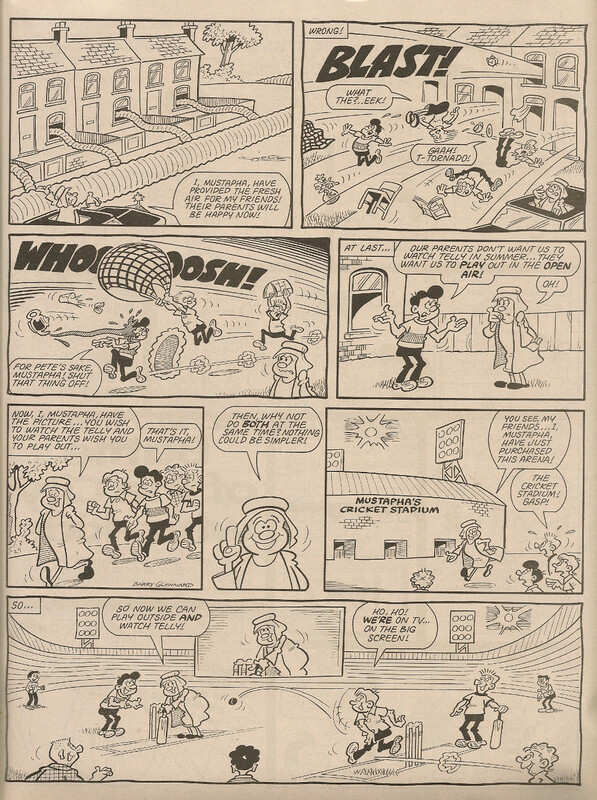 The cousins’ final Cheeky Weekly appearance was in the 23 September 1978 comic, wherein the menacing multitude was so great that counting them was impossible. 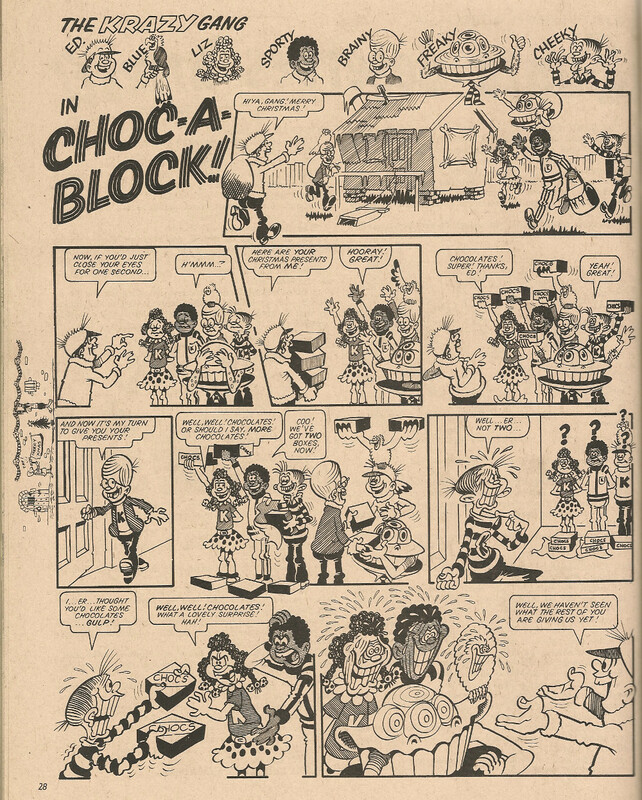 It seems that the intolerable infants were surplus to requirements once the depiction of Cheeky’s babysitting misfortunes was dropped from the comic. 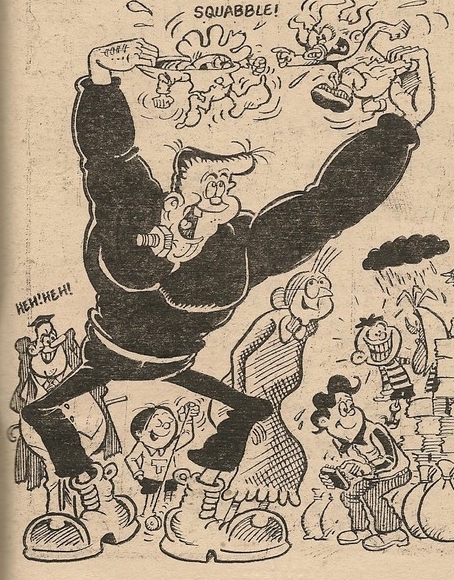 The cousins, none of whom were identified by name, terrorised our toothy pal in 6 issues of his comic. Yes, it's that plaything-preoccupied pipsqueak, Toy Boy, who had previously raided Mustapha in Whizzer and Chips dated 06 December 1986. 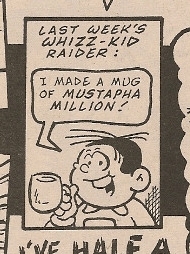 Unfortunately, the intensely annoying 'I made a mug of Mustapha Million' slogan now seems to have become permanent. It's just not cricket (sorry). 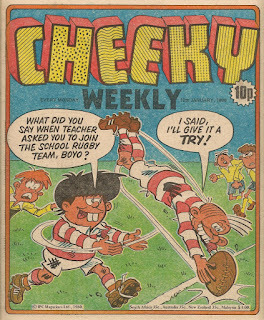 Cheeky is joined on the cover by Welsh wit Taff the Laff for rugby repartee. 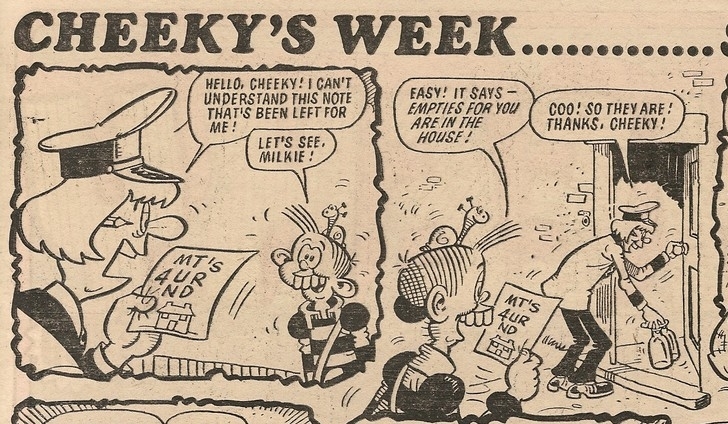 Over the page, Cheeky’s first gag while on his Sunday paper round (although we don’t actually witness him making any paper deliveries this week) is with Milkie, making his final Cheeky Weekly appearance. I don’t think milk was delivered on a Sunday in those days but I may be wrong. Paddywack continues to cause consternation thanks to readers’ jokes. I particularly like Jack Clayton’s background gags in the restaurant. There’s a rare turn from cravat-sporting ‘Showbiz Teacher’ in this week’s Stage School. 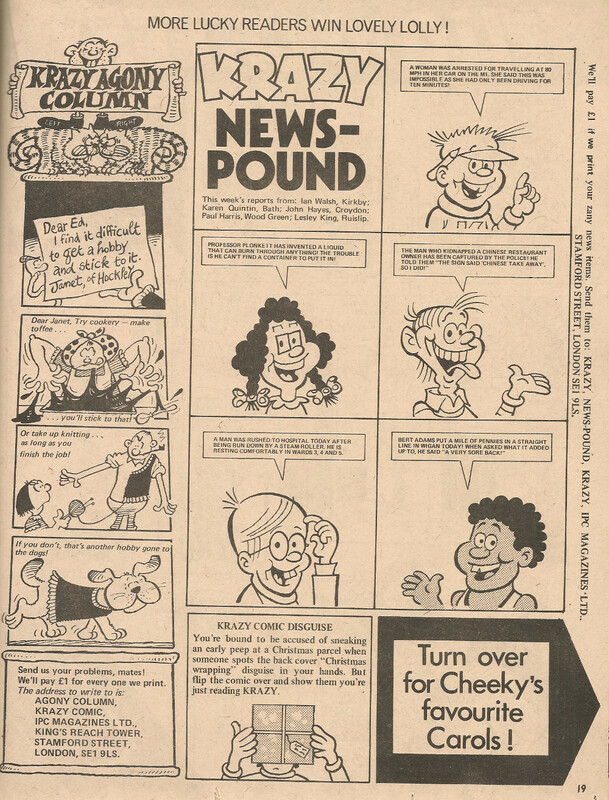 Page 11 includes an ad encouraging readers to place a regular order for Cheeky Weekly, a bit surprising since we now know the comic would survive for only 3 more weeks. 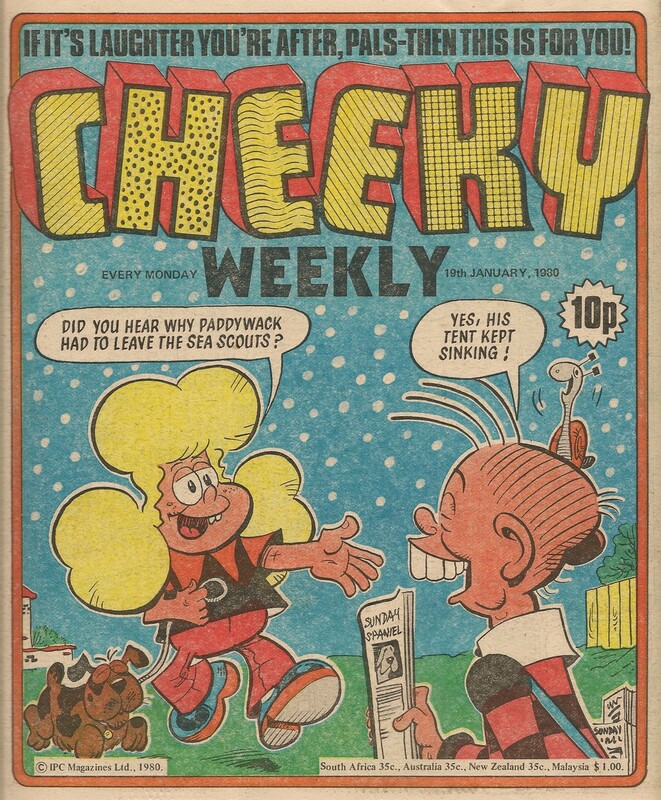 I’ve always wondered what happened to regular orders when a comic was merged – would the merged title, in this case Whoopee and Cheeky, automatically be substituted by the newsagent unless the customer specified otherwise? Obviously not in those cases where lucky readers were already receiving the absorbing comic in a multi-comic order. Farmer Giles harvests a crop of corn in this week’s Cut-Out Comedy Catalogue. 6 Million Dollar Gran is evidently undergoing some sort of memory-circuit malfunction during this week’s snowy episode, as she is under the impression that she existed in 1906, when she was actually built in 1977. The synthetic senior citizen is not the only one feeling the cold, as on the Chit-Chat page our toothy pal keeps us up to date with the seasonal sartorial choices of the production team. Meanwhile reader Douglas Bell notifies us that our favourite comic appeared in a recent edition of telly ‘tec series Shoestring. I wonder if there was a bit of a mix-up in the Cheeky office while the staff were comparing winter outfits, as on page 30 Cheeky seems to be introducing this week’s issue. Did someone forget that Cheeky's Week commences on Sunday, not Saturday? The back cover is again home to Snail of The Century, bringing the comic to another garden gagfest conclusion. Mike Lacey provides all the Cheeky's Week artwork this time round, and this is the final time he will draw Sunday, Monday, Tuesday and Wednesday. Frank McDiarmid furnishes the front and back covers. Vic Neill does the final of his four stand-ins for Robert Nixon on Elephant on the Run. Making their final Cheeky Weekly appearances along with Milkie are Cheeky's mum and Hypno-Tessa.